There was a period of time today when my classroom and its inhabitants were quiet and trying super hard to do their best on the first session of their state exams. Multiple choice. No one had a meltdown (until later), and even the ones who I thought might not try—they really, truly did try. As I slowly paced around the room, taking care to speak only of procedural matters (“This bubble is not filled in.”) for fear of invalidating our school’s test scores and putting all of our careers in peril, I read the passages (which seemed endless to ME) and questions that my students were attempting to answer. Make no mistake—like many teachers, I am blessed with a proclivity toward test-taking. I am just lucky; I have excelled at standardized tests my whole life. Please believe me when I tell you that I am not a teacher who is skating by intellectually. I haven’t tricked anyone into erroneously believing that I was intelligent enough to teach a curriculum placed before me. I probably walk the tightrope of being an obnoxious intellectual more than I like to admit. Because, really, who cares that I know the Latin name for that flower? Still, the following is true: I cannot tell you with any certainty that, had I sat down to tackle this test, given the same time period allotted these ten- and eleven-year-olds, I would have been able to a) complete it, or, b) attained a passing score. Forgive me for the annoying use of lettering there. This is not suggesting that we avoid high level logical thinking; just that we are clear in tests about what we want students to do. Critical thinkers tend to be at a disadvantage with such questions, simply because they can find arguments to support both possibilities. I cannot think of one individual I know, of any age, who would sit down with this test and feel confident that they had chosen the correct answers intended by the test-makers. And I know some freaking brilliant people. One might construe this as a teensy bit problematic. A LOT of people are alarmingly willing to drink the school reform Kool-Aid these days. High standards! That sounds great! It’s my opinion that adults of many occupations (especially parents, policymakers and school reformers) should have to take the tests before they sign off on the millions that finance them. Just for kicks, you know. All that aside, I also found it personally problematic that I had to shut down kids’ questions about what happened in Boston, because we had to begin in exactly 4.6 minutes, and we never made it back around to that discussion. As soon as the test was over, my class was required, by the laws of physics, to return to their usual loud, angry, paper-launching selves. Otherwise, they would have all turned into pumpkins. Five more testing sessions. Go team! 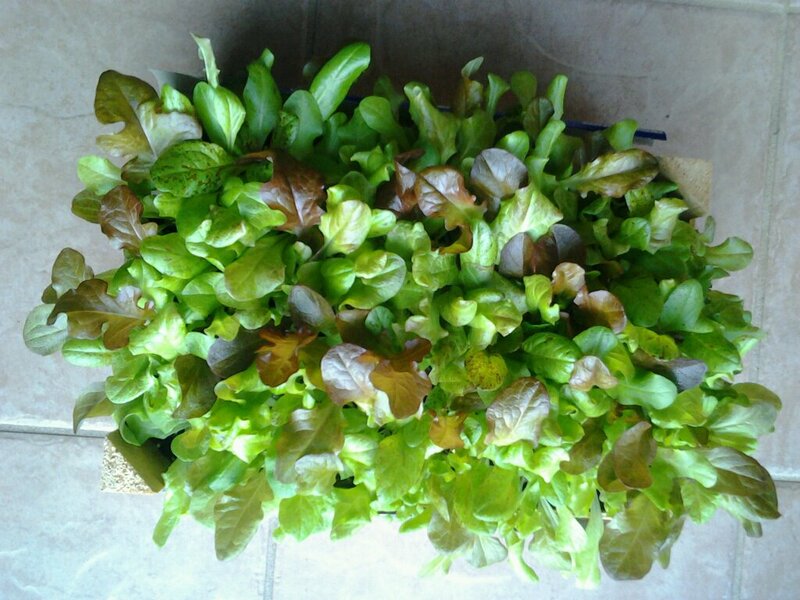 This is a lettuce garden that is growing in my home. It lives in a Clementine box. I love the lettuce garden, but I don’t expect it to be able to read graphs or do 3-digit by 3-digit multiplication, even if I taught it in every way possible, many, many times. I do, on the other hand, expect my classroom students to have more success than salad greens would. Answer: Yes. They could go to Zip Town. I know because I plussed 775 and 75 and 120 and got 970. This was actually a stronger-than-many answer, what with the accurate addition and all! They recognize that there are numbers in the word pile, and then they start seeing plus signs. And using the word “plus” as a verb. Yeah, we totally taught them that 735 times. And we totally didn’t say to them 970 times (strange numeric coincidence there) that almost NEVER would they see a word problem at their grade level that would be asking them to just add whatever numbers happen to show up somewhere in the word pile. I am considering bringing my lettuce box to school and teaching math to the lettuce box. Maybe the students would remember a tiny bit more? Perhaps they will be inspired by the way the lettuce doesn’t interrupt me to tell another lettuce box to stop looking at them. Or, it is possible that it would be best if someone would just break out the Flashy Thing and take me back to a time when I felt that working in an urban school was an honorable calling, when I was respected for working with these incredibly challenging children from unthinkable backgrounds; before that choice meant I could lose my job if my students didn’t pass the state test. I’ll just pack up my lettuce box and head on over to Zippy Ha Ha Land. You will be so proud of me. Since we just learned that our State Assessments are going to be even longer and more difficult, I decided to add a new component to my otherwise test prep-oriented teaching world. Of course, I will transform formerly dull, failing scores into shiny, passing ones. But, just in case that doesn’t pan out, Plan B awaits. So today, I stepped it up at work–I started career grooming a couple of students in earnest. Their future, world-competitive occupation? Perfume snipers! Inspired, I know. I can’t take full credit for this, truth be told. I can, however, take credit for the vision needed to see their hijinx as a veritable job aptitude survey! Behold the magic–while at specials, the girl in question (let’s call her Xena), produced a sprayable fragrance from I-don’t-want-to-know-where and took aim at the boy in question (we’ll call him Jethro), effectively emasculating him and rendering him unable to carry out any guyish pursuit he may have planned for the day. But that Jethro! What a self-starter! He responded with retaliatory spray from his own cleverly concealed cologne cannon, even whilst smelling like a girl! After which he categorically denied any involvement–until it was discovered that he carries his cologne in his shoe, which is a terrific sniper thing to do, as far as I am concerned. What are the odds of having two future perfume snipers in one class? Talk about gifted and talented. Xena and Jethro may not be able to determine the theme of a realistic fiction passage, or read the word “unfathomable,” but they can hide and spray fragrance, dammit! And I, for one, applaud them. Who says they will wind up flipping burgers? I see a much sweeter future for them, with light floral undertones.